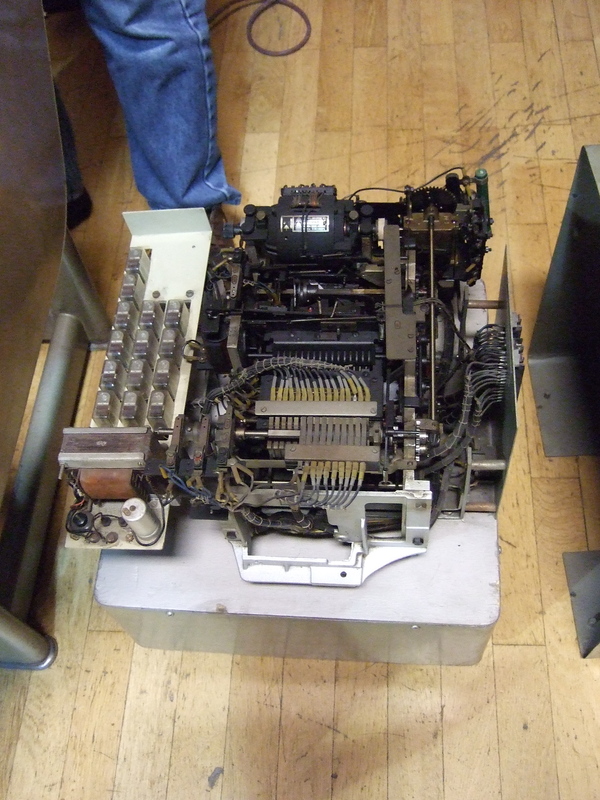 The 16th annual Vintage Computer Festival Europa (VCFe) is still ongoing this weekend in Munich, and of course Hackaday had to swing by. If you’re anywhere in Germany, you’ve still got until Sunday at 16:30 to check it out. The theme for this year’s festival is “The East is Red Colorful” and that means vintage computers from the other side of the Iron Curtain. Here in (West) Germany, that naturally means a good representation of computers from the former Democratic Republic of Germany (DDR), but Czechoslovakia, Yugoslavia, and of course Russia were also in the house. There was far too much going on to cover it all, but here’s a few of the projects and computers that caught our eye. This little blue beauty is testament to necessity being the mother of invention. In the mid-80s in Yugoslavia, it was illegal to import computers. You could try your luck getting through customs, and some did, but with microcomputer prices hovering around a month’s salary it wasn’t a good bet. Nevertheless, a few Z80s and Commodore 64s had gotten through customs, and there was a tiny microcomputer scene in the country. This all changed in December 1983 with the publication of the schematics for the Galaksija (Galaxy) computer in the science magazine of the same name. 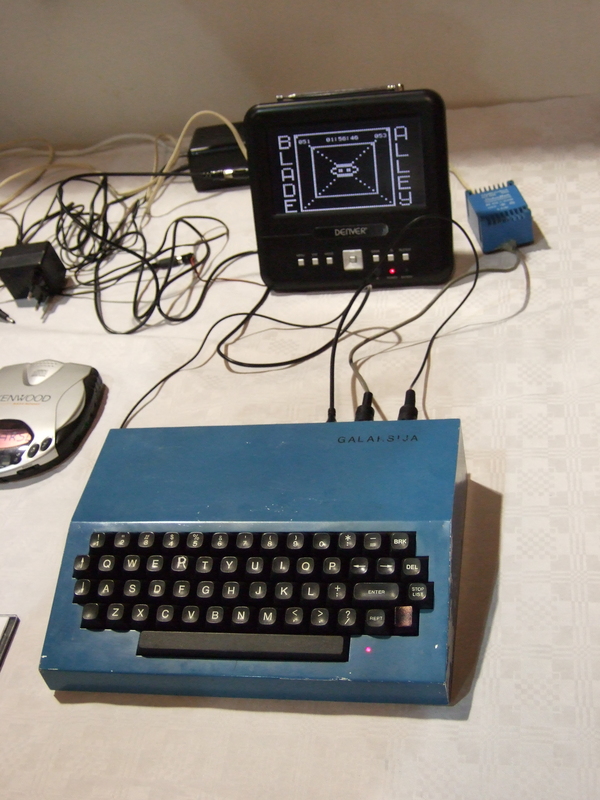 The Galaksija plans consisted of one single-sided PCB that included everything: processor, keyboard, and memory. It had to be manufacturable at home, cheap, and yet functional. Basically everything about the design is a response to these three constraints. There’s no video chip, for instance. PAL TV output was bit-banged by the Z80 CPU, taking 80-90% of CPU cycles just to draw the screen. Cleverly, the video output could be turned off in code when the programmer needed the chip for number crunching, so this wasn’t quite as bad as it sounds. Despite being a serious hack, it was a runaway success. The designers of the computer also sold a kit through the magazine, and estimated that around 100 or so people would build their design. More than 8,000 kits are known to have been sold, and nobody has any idea how many more readers went the full-DIY route. For individuals who wanted to get into home computing, it was the only game in town. Returning to the box in question, one aspect we love DIY work is the way that the builder’s spirit can shine through. Unlike most Galaksija computers which lie flat on their single PCB, this PCB was cut in half at the keyboard and re-attached at a more ergonomic angle. The all-metal case is completely custom, and quite a nice piece of work. (Most Galaksija never even had a case built for them, but sat naked on the PCB.) And you can even see the owner’s ghost in the R key, displaying a phenomenon more familiar to us with W, A, S, or D. R was the fire button in his favorite video game. (The current R key is actually a shift key re-painted. The shift key is taken from a later PC, covered over with nail polish, and simply soldered in place.) That corporate Dell just doesn’t tell stories like this. For a while in the late 1950’s the Ascota 170 was one of the most powerful electro-mechanical computers on the market. 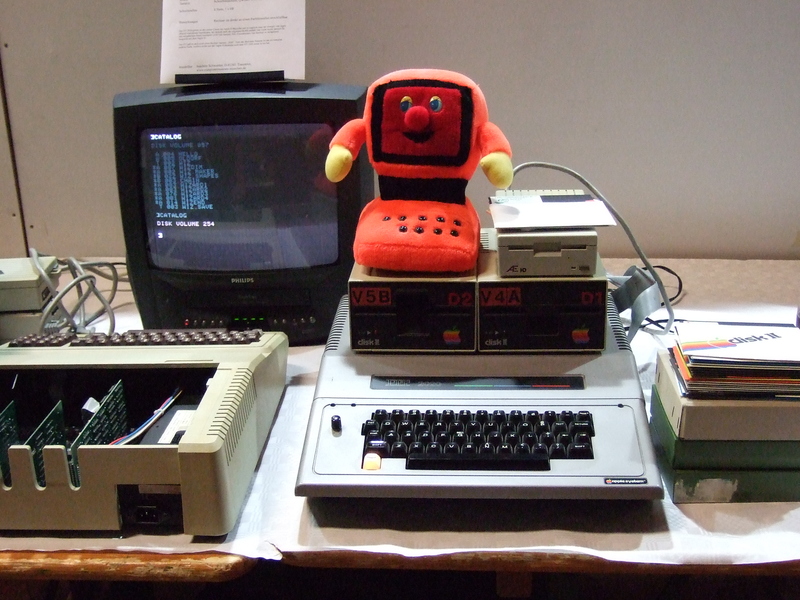 Manufactured by the VEB Bookkeeping Machines Factory in Karl-Marx City, it was essentially a computer that would do everything an accounting secretary for a large company would need. 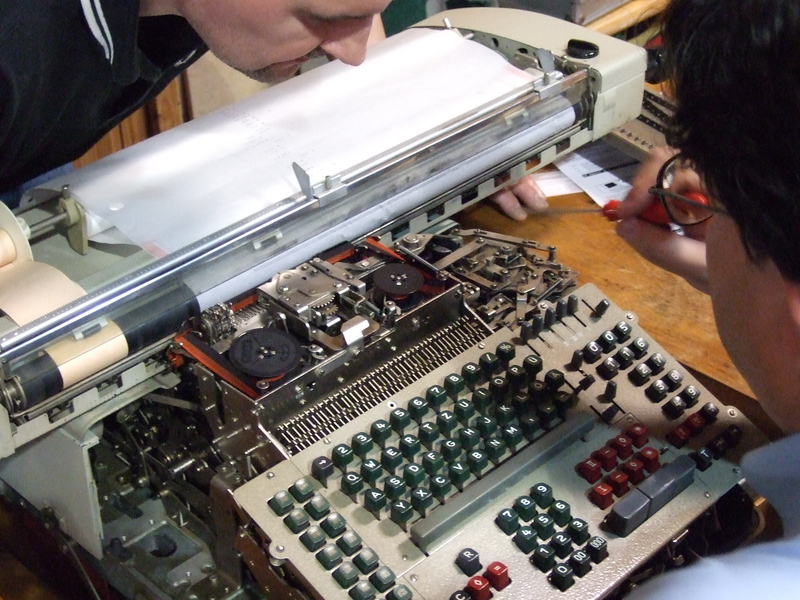 It typed automatically, calculated, and stored values in its 15 (mechanical) registers. One machine could do four (!) calculations in parallel. The two examples on display were trucked up from around Trento, Italy just for the festival. The owners didn’t know how much they weighed, but described them as “heavy”. If you’ve played around with mechanical typewriters, you’d recognize the smell of typewriter oil that filled the air around the two desk-mounted units and even spilled out onto the cardboard that the owners had thoughtfully covered the floor with under the unit on the left. They clicked, whirred, and were in continual motion — for some reason the typewriter ribbons continually spun in some kind of ancient wear-levelling scheme. In short, they were awesome. One machine had add, subtract, and subtotal. The other, later, model had the optional multiplication co-processor shown here. Much bigger than a breadbox and driven by its own separate motor, the co-processor was connected by this cable as thick as your fist. Think about how this works for a second: you have an all-mechanical adding machine that you want to add an all-mechanical multiplication machine onto. You certainly don’t want to tie them together with a spider’s web of strings and pulleys. Instead, a bunch of electro-mechanical relays turn the mechanical closing of contacts into electrical signals that then pass through the cable to be converted back into physical movement on the other side. The owners are still trying to figure out the programming language for the beasts. Here’s a photo of one of the programs that they do have on hand. The metal card, around a yard wide, is placed in the typewriter part of the machine, just behind the paper roll, and is read side-to-side by a bunch of levers with rollers on them. Here’s a video of a different Ascota running a program. While we were talking about the machine, a visitor came by and joked that they should unplug the devices at night because Germany’s trying to lower its power consumption to be able to turn off the nuclear power plants. The owner laughed politely, but then pointed out that the beasts actually run on a single AC electrical motor and draw between 80W at idle and under 200W at full tilt. We joked that if they oiled it up a little more maybe they could get them under 50W — after all, when it’s not actually throwing its levers around the main power loss is to friction. Prepare to die! The Nemesis crew have restored a multi-user dungeon (MUD) of the early 1990’s and was serving it up on a period DECstation 5000 for the festival. And speaking of old iron, the coolest display in the whole festival was this prototype high-resolution graphic terminal developed in the mid-80s at the Technical University of Munich (TUM). The white on this screen doesn’t glow like a monitor, but rather reads like a piece of paper. You’d be excused for thinking it was e-ink, but larger than a full sheet of paper and instantly updating. But back to the game. 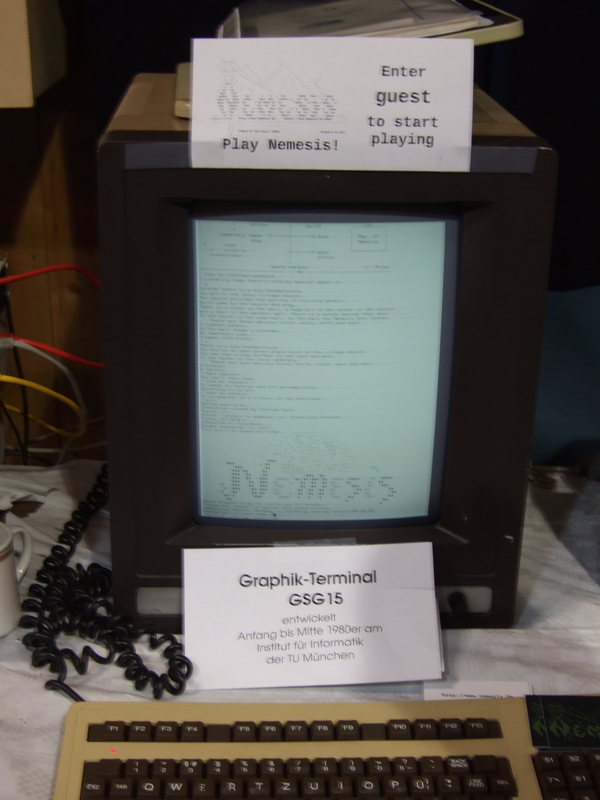 Nemesis itself is written in LPC, an object-oriented C-like language written for MUDs. That’s not just of interest to computer scientists — when a player gets to a certain level in the MUD, they can edit the code themselves, adding on to the world and even editing the players themselves. “Wizards” aren’t just players of the game, but also creators within it. 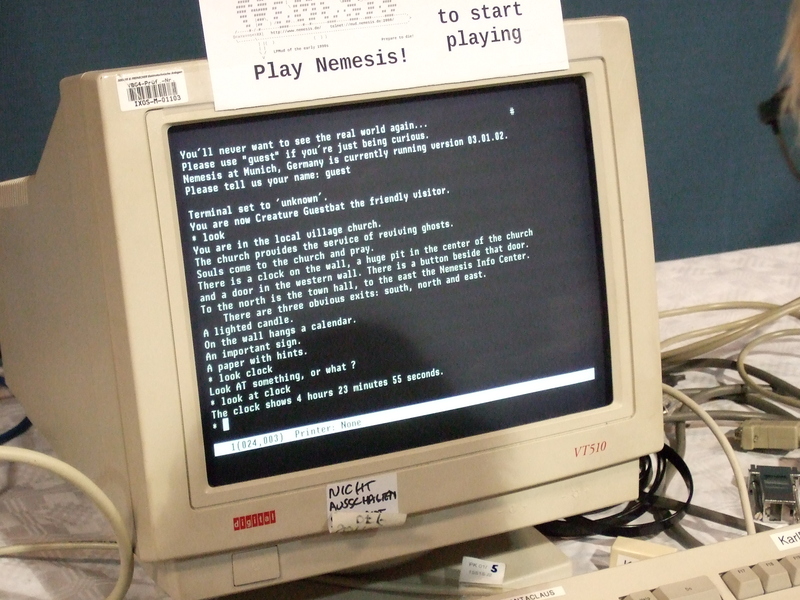 While most any MUD can claim to be the text-only precursor to today’s massively-multiplayer online games, Nemesis is additionally something like the programmer’s precursor to Minecraft. Plus ça change! Naturally it’s romantic to play the game in green-on-black phosphor screen, but you don’t have to be a retro aficionado to get in on the action. Outside of the festival, [Snake] runs the server on a modern virtual machine. Just telnet to mud.nemesis.de at port 2000 and you’re in. Get lamp. 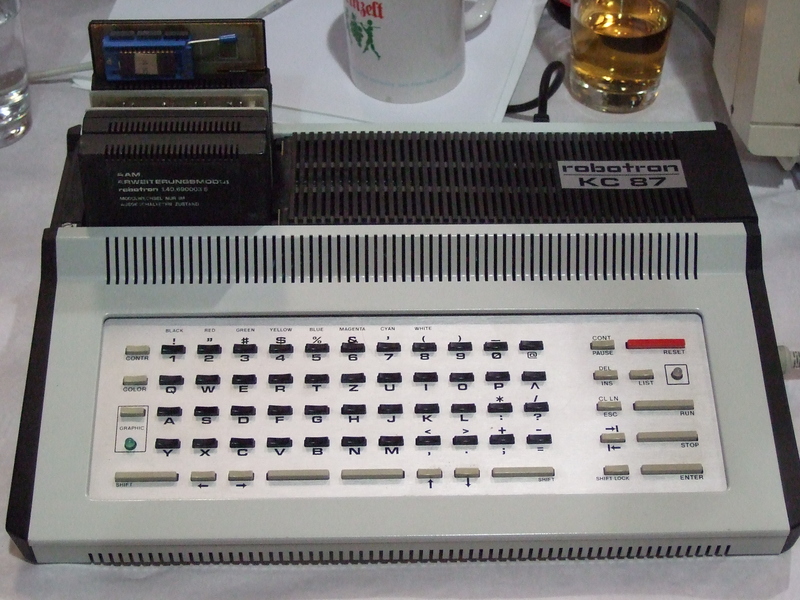 A lot of space was dedicated to the Robotron KC85 / KC87 family (“klein-computer”, literally small computer) and other similar devices based on the East German ripoff of the Z80 processor, the U880. Unfortunately, we didn’t get a chance talk to folks about them. We forgot how marvelous the noise that’s made when you shoot an asteroid in Asteroids is when it comes out of a large speaker inside a wooden case. Even more surprising was how well Crystal Castles holds up after all these years when played with real trackballs. And in keeping with the East vs West theme of this year’s festival, we had to play a little Tetris. Apple fanboys wouldn’t be disappointed either. No watches to be seen, but Apples ranging from the Apple I, through a number of Apple IIs, to an Apple LC pizza box were all represented. We shed a brief tear for our long-forgotten SE/30. Rounding out the event, there were talks galore and a swap meet. In short, everything the vintage computer aficionado could desire. If you missed this one, there are a number of similar festivals going on in Europe and the US. Check out the US mother site or its German daughter for details. Peripherals Behind The Iron Curtain. Wow … that punch card on steroids! I’m a little supprised you didn’t put any Wang pictures here. We generally try to keep the blog family-safe. Having been reading “The Thrilling Adventures of Lovelace and Babbage” (strongly recommended) the Ascota 170 reminds me irresistibly of the Analytical Engine. 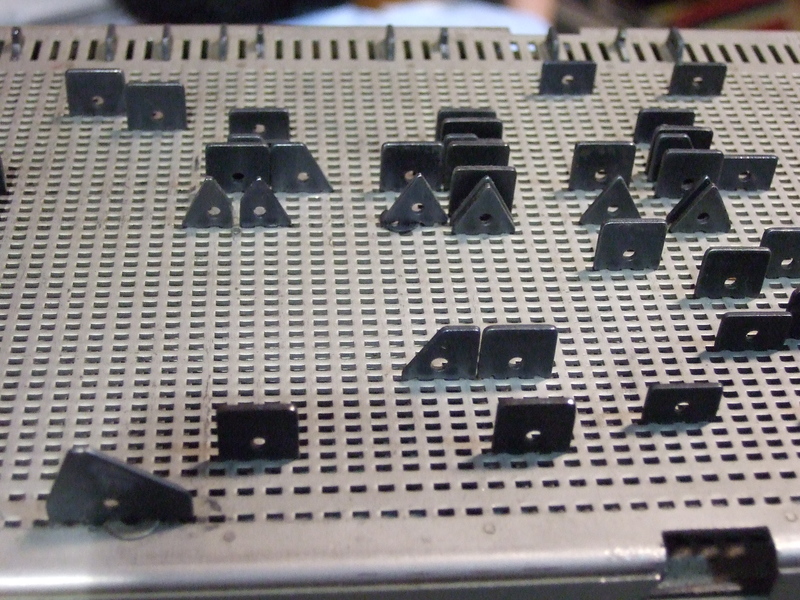 That, however, was intended to use neater punched cards than that great slab of metal. Wow, less than 30 years after the “Fall of Comunism” and people have completely forgotten how things really were back then. I was 13 years old in 1985, but I’m pretty sure Yugoslavians had access to most home computer models available in Western Europe. Contrary to popular belief, Yugoslavia was not really an “Eastern Block” country – they were not part of the Soviet-dominated economic and military organizations. Hell, there were over 1000000 Yugoslavian gasterbeiters in West Germany. 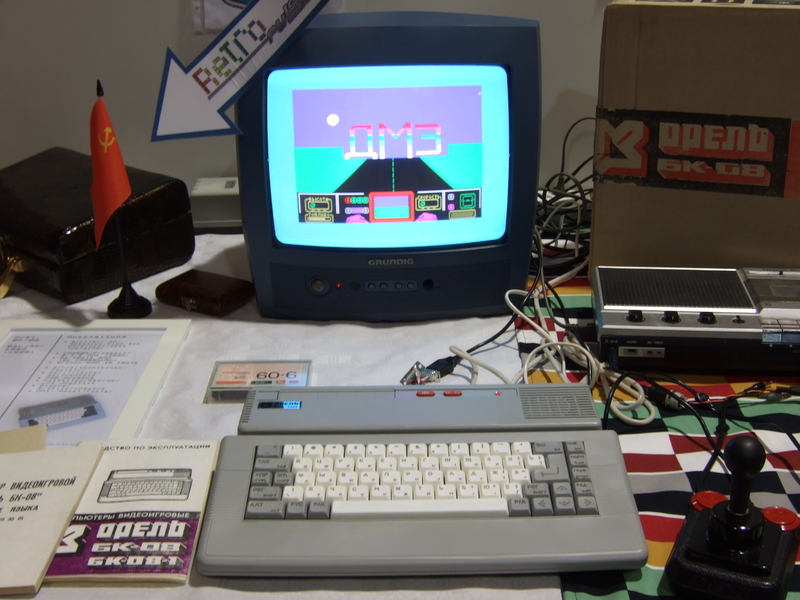 They used to produce a licensed version of the Oric Atmos – the Oric Nova and Spectrums, Commodores and later Amigas were quite common. There was this awsome weekly TV show called “TV Byte” with reviews of the latest hardware and software. It is NOT true that in Yugoslavia in 80’s and before and after “it was illegal to import computers.” It is simply not true. People were simply finding a way to smuggle various computers without paying import taxes and customs. All you had to do in Yugoslavia to import anything (Yugoslavia was part of the east as it was part of the west all the time) is to pay taxes and customs on importing computers above certain memory(RAM) treshhold. Sounds ridiculous but that was administrative measure to PROTECT domestic electronic industry that produced dozen types of computer systems for education, industry and home use. Removing protecting measures for Yugoslavia’s computer manufacturers and boxing-out screwing in working PC components imported from far East and importing them without taxes as spare parts, and defining it as as a “production”, is what actually destroyed domestic Yugoslav production of computers (and PCs) and in brain drainage on western-imposed and promoted war and economic and cultural and rasist “sactions” in the 90s, imposed on Serbian people, effectively stopped development of domestic computers in almost all ex-Yugoslavia area.